Cameron Mackintosh is delighted to announce casting for his acclaimed production of Boublil and Schönberg’s legendary musical MISS SAIGON at the Alhambra Theatre, Bradford from Wednesday 19 September to Saturday 20 October 2018. Christian Rey Marbella will play ‘The Engineer’, Sooha Kim ‘Kim’, Ashley Gilmour ‘Chris’, Elana Martin ‘Ellen’, Ryan O’Gorman ‘John’, Gerald Santos ‘Thuy’ and Aicelle Santos ‘Gigi’. At certain performances ‘Kim’ is played by Joreen Bautista. Christian Rey Marbella’s many theatre credits include The King and I playing ‘Lun Tha’, and Rodgers and Hammerstein’s Cinderella at the Newport Performing Arts Theatre in Manilla, and Jesus Christ Superstar, The Full Monty and Showboat at the Village Theatre in Washington. Christian has had a long and rich history with MISS SAIGON, having performed in productions in London, Manila, Asia, and several UK tours. Having previously alternated the role, he now marks his 10th anniversary with MISS SAIGON playing the role of ‘The Engineer’. 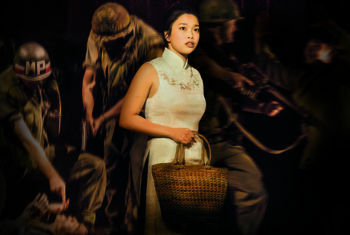 Sooha Kim made her professional debut in this recent production of MISS SAIGON at the Prince Edward Theatre where she covered the role of ‘Kim’ before going on to play the role in the Japanese production. Her credits whilst training in Korea include ‘Maureen’ in Rent and ‘Carmen’ in Fame. Ashley Gilmour also appeared in MISS SAIGON at the Prince Edward Theatre. His most recent credits include playing ‘Link Larkin’ in the national tour of Hairspray. Elana Martin’s West End credits include Travesties at the Apollo Theatre and Merrily We Roll Along at the Harold Pinter Theatre. Her other credits include the UK tours of 39 Steps and Scrooge. Ryan O’Gorman played the role of ‘Tom Collins’ in the 20th Anniversary UK Tour of Rent. His other theatre credits include Les Misérables, at the Queen’s Theatre, The Phantom of the Opera at Her Majesty’s Theatre, Billy Elliot at the Victoria Palace Theatre and the UK tour of Oliver!. Aicelle Santos is a recording and concert artist in the Philippines appearing in many concerts as both a solo performer and one third of the successful trio ‘La Diva’. As an actress, her theatre credits include Katy, Rak Of Aegis for which she won a Best Actress in a Musical award and Maynila Sa Mga Kuko Ng Liwanag for which she won a Best Featured Actress in a Musical award. They are joined byIroy Abesamis, David Allwood, Jonathon Bentley, Vinny Coyle, Divine Cresswell, Kristine Diaz, Aynrand Ferrer, Ross Lee Fowkes, Seng Henk Goh, Yukina Hasebe, Rob Herron, David Kar-Hing Lee, Amanda Lindgren, Winchester Lopez, Jade Ma, Thao Nguyen, Samuel Nicholas, Youngjoo Park, Pierce Rogan, Kerry Spark, Louis Stockil, Eloisa Amalia Tan, Gavin Tsang, Joaquin Pedro Valdes, Brad Veitch, Amadeus Williams, Gabriella Williams, Sian Yeo, Zheng Xi Yong and Gerald Zarcilla. Last year, this production of MISS SAIGON opened on Broadway where it played to nightly ovations and was nominated for the Tony Award for Best Revival of a Musical. The New Yorker called it a “Dynamite Broadway revival”. When the smash-hit run of this production opened in London in May 2014 to record-breaking advance sales and critical acclaim, Dominic Cavendish in The Daily Telegraph wrote, “This thrilling new production spills out beyond the theatre and speaks directly to the times we live in”. The show swept the board at the 2015 Whatsonstage.com awards winning a record breaking nine awards, the most awards ever won by a single show in the 15-year history of the awards including: Best West End Show and Best Revival of a Musical. MISS SAIGON tells the story of the last days of the Vietnam War, 17 year-old Kim is forced to work in a Saigon bar run by a notorious character known as the Engineer. There she meets and falls in love with an American GI named Chris but they are torn apart by the fall of Saigon. For 3 years Kim goes on an epic journey of survival to find her way back to Chris, who has no idea he's fathered a son. Since its London premiere in 1989, Cameron Mackintosh’s production of Alain Boublil and Claude-Michel Schönberg’s legendary musical MISS SAIGON has become one of the most successful musicals in history. The original Broadway production of MISS SAIGON opened on April 11, 1991 with what was the largest advance sale in Broadway history ($37 million). The show went on to play for nearly ten years and 4,063 performances seen by more than 5.9 million people. MISS SAIGON has been performed in 32 countries, over 300 cities in 15 different languages, has won over 40 awards including 2 Olivier Awards, 3 Tony Awards, and 4 Drama Desk Awards and been seen by over 36 million people worldwide.